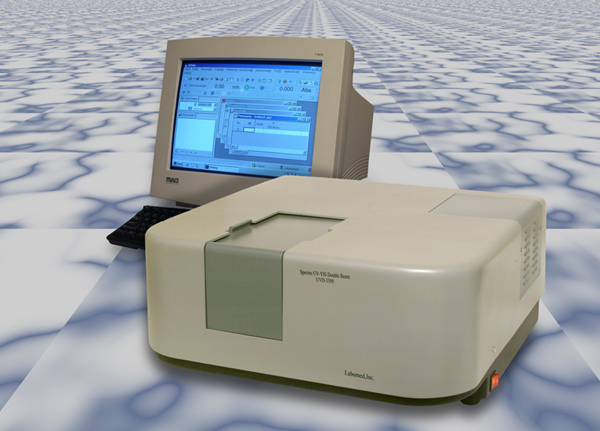 Spectro UV-VIS Double Beam UVD 3500 has a powerful built in software which permits this instrument to be linked to a computer and a printer to display the photometric and spectral data on the PC monitor. This spectrophotometer is rugged, reliable, affordable, and maintenance free. Spectro UV-VIS Double Beam UVD 3500’s enhanced transmission and full reflection makes this double beam spectrophotometer highly effective and reduces noise. ISO 9001-2000, has CE Conformity and is FDA Licensed. Spectro UV-Vis Double Beam (Model UVD-3500) with variable bandwidth of 0.5, to 5.0 nm is a high-performance, reliable, and exceptional value instrument which is the hallmark of Labomed UV-Vis spectrophotometers. Excellent Performance : The high- performance blazed holographic grating and the optimized CT-type monochromator reduce stray light, and widen the photometric range. Ideal baseline stability: Double-beam dynamic feedback ratio recording photometric system coupled with reasonably designed electric control system ensures high stability of the instrument baseline. High resolution: The unique optic design of full-transmission and full-reflection satisfies both needs of the double beam optic and the enhancement of the light energy of instrument so as to reduce noise and guarantees high resolution. Accurate wavelength: The automatic wavelength driving system and the automatic light source interchanging system ensures wavelength accuracy and high holistic performance of instrument. Easy accessories replacement: the detachable structure of the sample chamber facilitates change of a wide range of optional accessories and ensures wavelength accuracy of instrument. Easy light replacement: The open-type design of light source chamber, socket deuterium lamp and socket tungsten halogen lamp facilitates light source over replacement, simplify maintenance and reduces operation error. Versatile Application: The application software on Windows platform offers rich operation and data processing facilities, representing to the full the fascination of modern computer technology. - Spectral bandwidth: 0.1, 0.2, 0.5nm, 1.0nm, 2.0nm, and 5.0 nm. 2) Photometric System: The double-beam ratio recording system. - Continuously variable spectral bandwith from: 0.1, 0.2, 0.5, 1.0, 2.0 and 5.0 nm. -Detector: Hi sensivity R928 multiplier detector.